THIS IS OUR LIGHTEST WEIGHT WICKING GOLF SHIRT. Take to the golf course or the boardroom with confidence. Engineered with renowned Dri-FIT fabric for the ultimate in performance. THIS IS OUR LIGHTEST WEIGHT WICKING GOLF SHIRT. Take to the golf course or the boardroom with confidence. 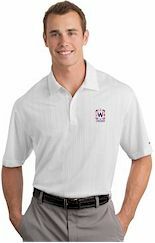 Engineered with renowned Dri-FIT fabric for the ultimate in performance, this lightweight sport shirt has a striking drop-needle vertical texture The American Wallyball logo. Features a self-fabric collar, four-button placket. Made of 4.7-ounce, 100% Cottonr Dri-FIT fabric.